The proof is in the Proof. The Giro Proof Glove is designed for complete comfort in unpredictable weather. Featuring a wind resistant exterior shell, the Proof uses a waterproof, breathable performance Hipora™ liner and a combination of PrimaLoft® and Thinsulate™ XT-S insulation with X-Static® anti-microbial fiber to keep you warm and dry when it counts. The fleeced interior features AGrid™ technology, which utilizes a woven grid to hold heat. Reflective detailing and Touchscreen Technology™ help you to be seen, and stay in touch without slowing you down. Wind-resistant external shell, waterproof, insulated and breathable inner liner. Super Fit engineered 5-fingered design. PrimaLoft insulated upper offers warmth without bulk. Clarino palm with Thinsulate XT-S insulation. Touchscreen Technology™ for use with mobile devices. Reflective accents for improved visibility in low-light conditions. Temperature rating: 25° to 35° F.
Closure: Extended Merino wool cuff, hook-and-loop strap. Have done a handful of rides with these gloves with temps in the 30s F. Excellent protection, kept hands and fingers warm. For me, they are probably too warm over 45 F. They were a steal at $35 or so (don't remember exact amount). 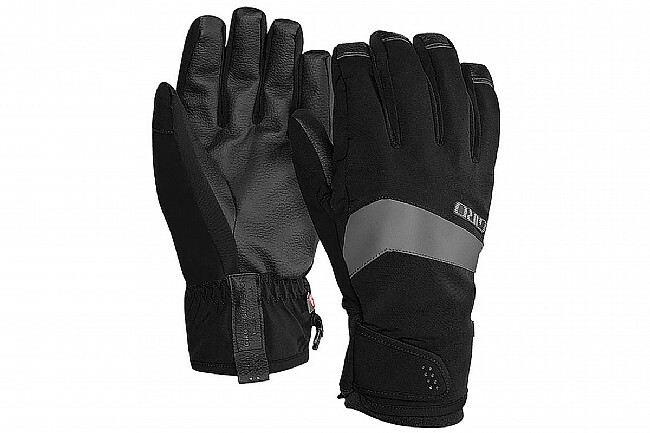 I have tried many pairs of gloves and few make the cut for cold weather, wind resistant gloves...these do. They are wind resistant but do get a little sweaty inside after a couple of hours of comfortable riding in the low to mid 30 degree range with no liner. Too warm for 35 degrees. Super warm, these are listed on road.cc as one of the best Winter gloves for cycling and now I can see why. I wouldn't hesitate to wear these in temperatures below 25 if only my feet could handle it, at the closeout price I'm tempted to buy another pair. The only complaint I might have is difficulty shifting when in the drops but that's to be expected with bulky gloves, when in the hoods I really don't have any trouble. Also nice that you can use your phone with these on.